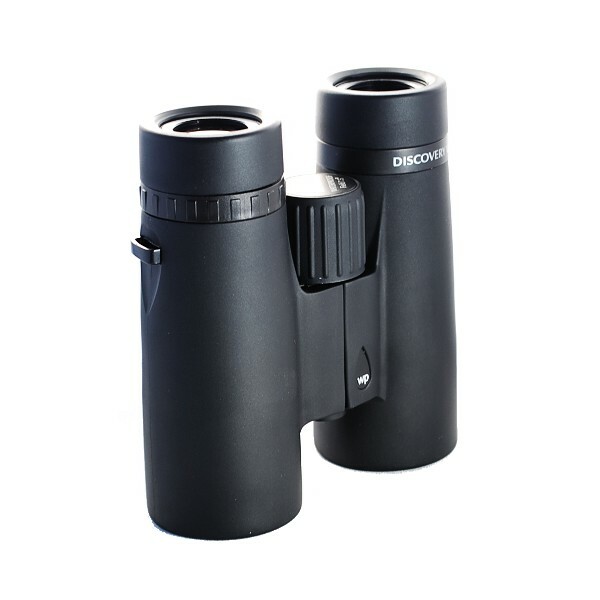 The Opticron Discovery 7x42 binocular is a pretty respectable little 7x42 binocular. It's got a smooth, sleek look. It's completely black. It looks good. Fully waterproof, nitrogen purged, and comes with all the features you look for at this price. The 7x42 model is constructed using a magnesium body covered head to to with rubber armor. As far as 7x42 binoculars go, it's about average weight (a little under 25 ounces), but both height and weight are right around five inches, making this one of the smallest full size 7x42 binoculars we've seen. They feel very well balanced in the hands, and at one point during the initial reivew, we referred to the Discovery WP PC 7x42 as "a pleasure to look through." Everything about the Discovery 7x42 feels well thought out and executed. Build quality is excellent. They feel precisely engineered and constructed, and based on this alone, they may be well worth the price. The center body hinge does feel too tight, but that also means that interpupillary distance isn't something that will need constant adjustment. The eye cups are three position twist-up eye cups. They are very tight with absolutely no play whatsoever. The outer edges of the cups (where they meet the sockets of your eyes) are quite a bit thinner than some other models, and they are beveled on the inner edges. The middle position on both cups is a little mushy in that there isn't much in the way of affirmative click to let you know it's set, but they do stay in that position once set. The diopter is made of some kind of plastic and features some small, square, raised ridges for grip. At first, we were concerned that the diopter might be a little too tight, but it did loosen considerably after its initial turn. Adjustment is marked by some very soft clicks, not audible, but definitely tactile. Setting the diopter was very easy and the job was done in about two seconds. Again, immediately comfortable. The focus knob is identical (at least aesthetically) to the knob on the Opticron Oregon 4 LE WP, molded plastic with some raised ridges for grip. Resistance throughout the focus range is even and smooth, and the knob rotates about 1.5 revolutions from close focus (4.9 feet) to infinity. During viewing, it seems like we're always within a half turn or so of where we need to be, it's very easy and quick to focus. The rubber armor feels a little thin, and it's possible that grip might be compromised in rainy or snowy conditions because of the completely smooth finish. There is a portion of the body underneath (where the thumbs rest) that has a slight depression with a bit of texture, but this seems more aesthetic and less functional. It doesn't do much for grip. Optically, the Opticron Discovery WP PC 7x42 binoculars are a solid performer. Combined with the relatively quick focus and easy to set diopter, the clarity and sharpness makes for an excellent viewing experience. These binoculars are very bright. Chromatic aberration is noticable, but only when viewing objects that are a stark contrast to a background. In all other situations, it's not noticeable. There does seem to be a hint of field curvature, but we had to actively look for it to notice it. One thing that we were really happy with is the 7.5 degree field of view. 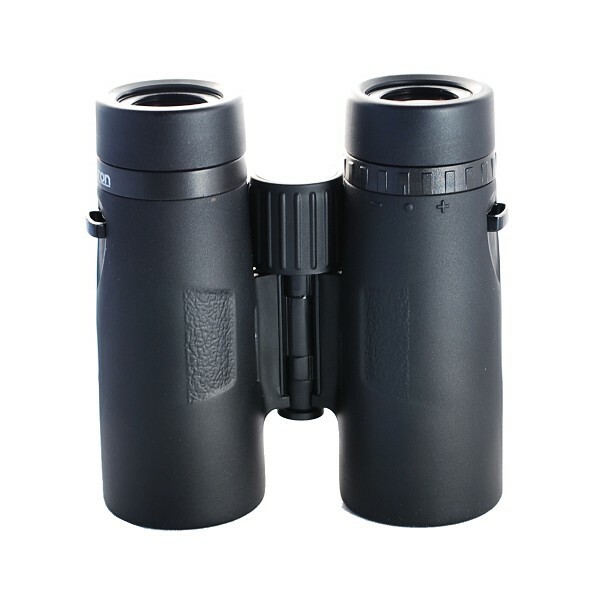 The wider the better, at least in our opinion, and anything between 7 and 8 degrees on an 7x42 binocular is respectable. So here's a recap. Build quality, good. Optics, good. The rubber armor seems thin, and it doesn't provide a whole lot of grip. And our biggest gripe is that the tripod thread at the front of the body hinge is a little difficult to get to because there's very little to grip on the thread cap. And that's not a big deal. If you're an avid birdwatcher, you probably already know about the Opticron WP PC 7x42. If you're a beginner birdwatcher, you may have heard of it. If you're a hunter, you're probably saying, "Who?" If you fit into any one of these three groups, the Opticron Discovery WP PC 7x42 binocular is a solid piece of optical equipment that deserves serious consideration. 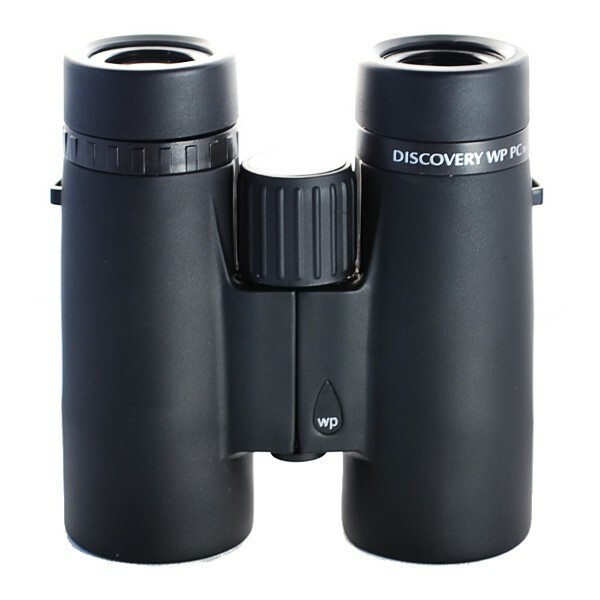 The Opticron Discovery WP PC 7x42 binocular includes soft carrying case, neck strap, rain guard, and lens caps.